but ultimately it is the mother's decision whether or not to continue smoking. Your pregnancy can be a powerful motivation to give up smoking, because you're making this choice on behalf of your unborn child who is completely dependent on you. Smoking not only exposes the foetus to toxins in tobacco smoke, but it also damages placental function. Click here to view - "Surprising Ways Smoking Affects Your Looks and Life". Smoking makes it harder to conceive, irrespective of which partner smokes. Both female and male smokers have lower fertility levels, while adults who were born to mothers who smoked have less chance of becoming a parent themselves. Smoking also reduces the chances of IVF (In Vitro Fertilization) succeeding. It's thought nicotine reduces a woman's fertility by affecting the production of hormones that are necessary for pregnancy. Smoking also impedes the transportation of the egg through the Fallopian tubes to the womb. Male smokers tend to have a sperm count that is 15 per cent lower than that of non-smokers. Quitting smoking will increase your ability to conceive and your likelihood of success with IVF. If your health isn't enough to make you quit smoking, then the health of your baby should be. Smoking during pregnancy affects you and your baby's health before, during, and after your baby is born. The nicotine (the addictive substance in cigarettes), carbon monoxide, and numerous other poisons you inhale from a cigarette are carried through your bloodstream and go directly to your baby via the umbilical cord and placenta. Lower the amount of oxygen available to you and your growing baby. Increase your baby's heart rate and formation of heart defects. Increase the chances of miscarriage, stillbirth and SIDS. Increase the risk that your baby is born prematurely and/or born with low birth weight b(below 2.5kg or 5lb 8oz). Increase your baby's risk of developing respiratory (lung) problems. Increase the risk of developing vision problems and colic. The more cigarettes you smoke per day, the greater your baby's chances of developing these and other health problems. There is no "safe" level of smoking while pregnant. How Does Secondhand Smoke Affect Pregnancy? Secondhand smoke (also called passive smoke or environmental tobacco smoke) is the combination of smoke from a burning cigarette and smoke exhaled by a smoker. The smoke that burns off the end of a cigarette or cigar actually contains more harmful substances (tar, carbon monoxide, nicotine, and others) than the smoke inhaled by the smoker. If you are regularly exposed to secondhand smoke, you increase your and your baby's risk of developing lung cancer, heart disease, emphysema, allergies, asthma, and other health problems. Babies exposed to secondhand smoke may also develop reduced lung capacity and are at higher risk for sudden infant death syndrome (SIDS). 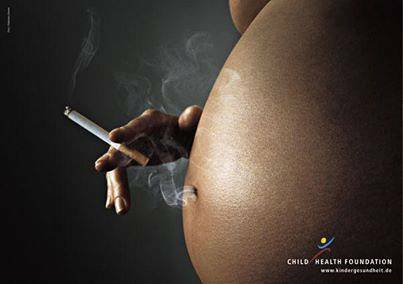 If you are a smoker and your pregnant or plan to be you have the very best reason in the world to quit smoking immediately. If you are pregnant, the reasons for quitting smoking are twice as important and the benefit you will pass on to your baby will be a gift of a better life right from the very beginning. Please don’t think about it, don’t hesitate, just quit smoking and drinking of course, as soon as you possibly can. As a smoker you are probably already aware of the health problems that you can develop while smoking such as: back pain, heart disease, hypertension, lung cancer and mouth cancer. However, you may not be aware of the serious health problems your baby can develop as a result of your smoking. When you smoke while pregnant, your pregnancy can be seriously affected. You can develop Placenta Abruption, Placenta Previa or you can go into pre-term labor. Click here for video "Smoking Linked to Back Pain"
Click here for article "Maternal smoking may lead to cerebral palsy in offspring"
The amount of life carrying oxygen your baby gets will increase. Your baby’s lungs will grow better and work much better. The chances of having a premature birth will go down. Normal birth weight is more likely. There is a reduced risk of development problems such as delayed speech, cerebral palsy. Visual, hearing and learning difficulties will all be reduced too. Carbon monoxide and the other deadly chemicals from tobacco smoke in cigarettes will not get into the baby’s blood where they can limit the baby’s growth. We have already covered most of the benefits you will personally enjoy so we won’t repeat them here. You know quitting is the right thing to do. Quitting before you become pregnant is best, early in your pregnancy is the next best time, but it is never too late to quit smoking during your pregnancy. Some women are tempted to just cut down while they’re pregnant, but that is not a good idea. There is still a lot of poison (toxins) going directly into your unborn child. Some women also worry about weight gain if they quit. Weight gain during pregnancy is perfectly normal. Don’t use it as an excuse. You may know someone who smoked and had a beautiful healthy looking baby. Those babies are more likely to have health problems you can’t see. They may have reduced immune systems and suffer more colds and flu illnesses. It is just not a smart idea to smoke and especially if you are pregnant. After your baby arrives, avoid letting people smoke around you both. How Can I Quit Smoking Before or During Pregnancy? There are many smoking cessation programs available to help you quit smoking. At Advanced Healthcare, Dr. Pisarek provides a safe and painless laser quit smoking program using low-level laser therapy (LLLT) which has a greater than 70% success rate. Low-Level Laser (LLLT): See above. Going Cold Turkey: Many pregnant women go cold turkey while trying to kick the smoking habit. This method is very simple. You simply throw out all of your cigarettes, lighters and smoking paraphernalia and stop smoking all at once. This method of quitting smoking is about five percent effective, however, many mothers who use this method to stop smoking while they are pregnant start smoking again after they deliver their baby. Tapering Off: If you don't have the will power to go cold turkey, then you can try tapering off your smoking. If you use this method then you will want to taper off to zero cigarettes a day by the beginning of your 14th week of pregnancy. This will reduce the chances that your smoking will impact the health of your pregnancy and your baby. This method for quitting smoking is also about five percent affective. Nicotine Replacement: Nicotine replacement therapy is another method you can use to quit smoking and has minimal effect being about 10%. Nicotine gum and patches release nicotine into the bloodstream of the smoker who is trying to quit. Although these products can reduce withdrawal symptoms and decrease cravings in smokers who are trying to quit, the safety of these products hasn't been adequately evaluated in pregnant women. This method should be thoroughly discussed with your physician. Counseling: Counseling is an effective method for long term results. It can be used alone or coupled with one of the above quit smoking methods. This method involves talking with a counselor or meeting with a support group. Usually the root of your addiction to cigarettes is addressed, as opposed to simply removing the temptation of cigarettes from your life. This method is safe to use during pregnancy as it is non-invasive. Hide your matches, lighters, and ashtrays. Designate your home a non-smoking area. Ask people who smoke not to smoke around you. Drink fewer caffeinated beverages; caffeine may stimulate your urge to smoke. Also avoid alcohol, as it may also increase your urge to smoke and can be harmful to your baby. Change your habits connected with smoking. If you smoked while driving or when feeling stressed, try other activities to replace smoking. Keep mints or gum (preferably sugarless) on hand for those times when you get the urge to smoke. Stay active to keep your mind off smoking and help relieve tension: take a walk, exercise, read a book, or try a new a hobby. Look for support from others. Join a support group or smoking cessation program. Do not go places where many people are smoking such as bars or clubs, and smoking sections of restaurants including patios. The sooner you stop smoking, the better it is for both you and your baby!